NASA will announce a new discovery by its planet-hunting Kepler space telescope today, and you can following the unveiling live online. Space agency officials and scientists will host a live news teleconference at 2 p.m. EDT (1800 GMT) to unveil the new Kepler planet discovery. You can watch and listen to the webcast of the NASA Kepler discovery announcement live on Space.com. "Launched in March 2009, Kepler is the first NASA mission capable of finding Earth-size planets in or near the habitable zone — the range of distance from a star in which the surface temperature of an orbiting planet might sustain liquid water," NASA officials wrote in an alert announcing today's breifing. "The telescope has since detected planets and planet candidates spanning a wide range of sizes and orbital distances, including those in the habitable zone. These findings have led to a better understanding of our place in the galaxy." Victoria Meadows, professor of astronomy at the University of Washington, Seattle, and principal investigator for the Virtual Planetary Laboratory, a team in the NASA Astrobiology Institute at Ames. Since its launch, the Kepler spacecraft has discovered 961 alien planets, more than half of the nearly 1,700 exoplanets discovered by scientists around the world to date. The $600 million mission has also detected 3,600 candidates for alien planets, and scientists are working to confirm the existence of those worlds in follow-up observations. Kepler's primary mission ienede in May 2013 when the second of its four orientation-maintaining reaction wheels failed. NASA scientist are currently evaluating plans for a new mission, one that does not need the ultra-precise pointing capability of all four reaction wheels. That mission is called K2, and would allow Kepler to continue searching for alien planets, as well as study supernovas, asteroids and comets. 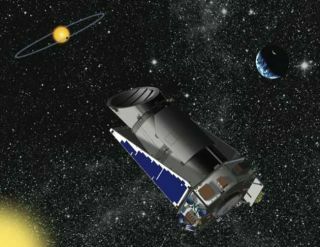 Tune in to Space.com at 2 p.m. EDT when we will learn the exact nature of NASA's Kepler discovery today.